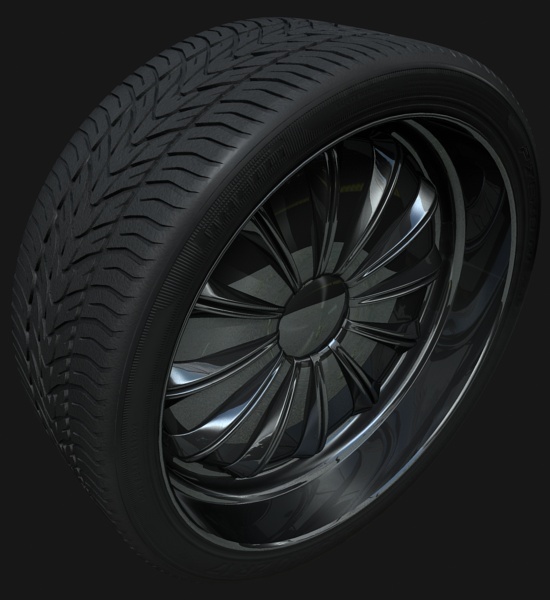 Using the Max 9 Mental Ray shader Arch & Design we will create a simple tyre texture. We assigned groups in the previous section to enable us to give different textures to different areas of the tyre. 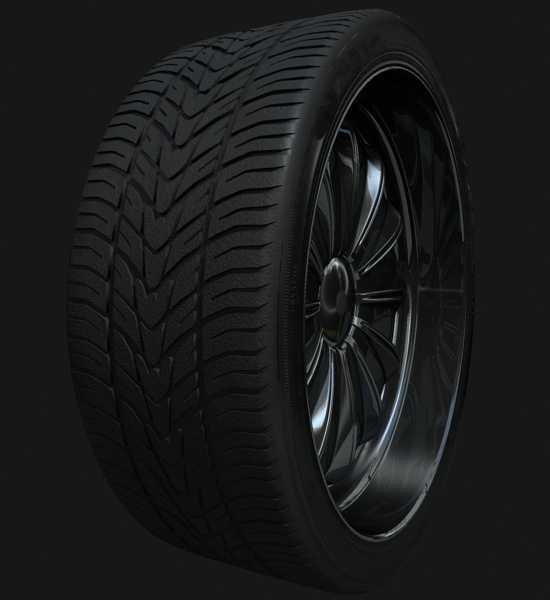 This might be sufficient for some uses but will use a slightly more complex Blend material, blending between the main tyre sidewall texture and the tyre tread texture. 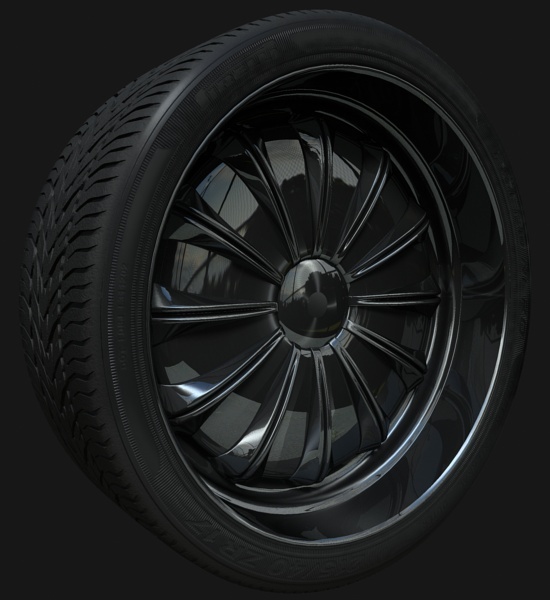 The sidewall texture will be a slightly glossy rubber texture (not too new, not too old). The basic rubber material is slightly reflective but very diffusive. This is perfectly suited to the Arch & Design MR material. We wish to reflect the environment but a VERY blurry version, and still have some glossy highlights. The tyre tread texture will be a diffusive matte texture which will represent the new rubber that has picked up all the dust and dirt from the floor. We will create a noisy texture to represent this. A custom gradient texture will be used to blend between the 2 main textures. This texture is for the tyre sidewall, the face on the side of the tyre. We will setup a slightly shiney texture and add a bitmap for the text/mouldings. Load in an Arch & Design texture to a blank slot. Setup the Reflection, Anisotropy and BRDF Custom Reflectivity Function as shown below. Where the Front colour (A) should be a VERY dark grey, and Side colour (B) should be black. If you want your tyre to appear more worn/older then make the Front colour lighter. Now we add 2 more maps. The environment reflection map (This is only needed if you don't have an environment to reflect) and the Bump map. A selection of bump maps are available from www.cg-cars.com in the Textures section - this version supplied by 1xpfree. Also added here is an HDRI to the Environment slot. To change the "shinyness" of the trye adjust the BDRF and reflection values. For a "wetlook" finish to the tyre turn the Glossiness value up towards 1.0. To change the age of the tyre try making the Front colour a lighter grey colour. Where Color #1 is 27,27,27 and Color #2 is 51,51,49. These can be adjusted to represent different layers of dirt and dust. I used a very subtle effect. Where color #1 is 27,27,27 and Color #2 is 212,212,212 and noise type is Turbulence. This give a very subtle rough appearance to the Tyre tread surface. We can now setup a Blend material using the 2 above textures. Load in a Blend material to an empty slot. Drag and drop the textures we created above to the slots as shown below. The Tyre sidewall goes in the Material 1 slot, and the Tread texture in the Material 2 slot. We will create a gradient texture for the Mask map. Setting the Map Channel to 2 means we can adjust the scale and positioning of the blend independently to Channel 1 (which we will use for our Bump map on the Tyre sidewall texture). The actual position of the upper blend (Where it goes from Black to white) is where the Tyre tread will appear on the Tyre. This area will depend on the height of your tyre tread and curvature of the tyre tread. The image below shows what the Gradient Ramp looks like when applied separately on the tyre object. I used an instance of the Gradient Ramp in a separate standard material to test this - you can then adjust the Gradient Ramp to get the same effect. Now apply a second UVW Mapping modifier to the tyre (leave it as Map Channel 1) and the same position as above. 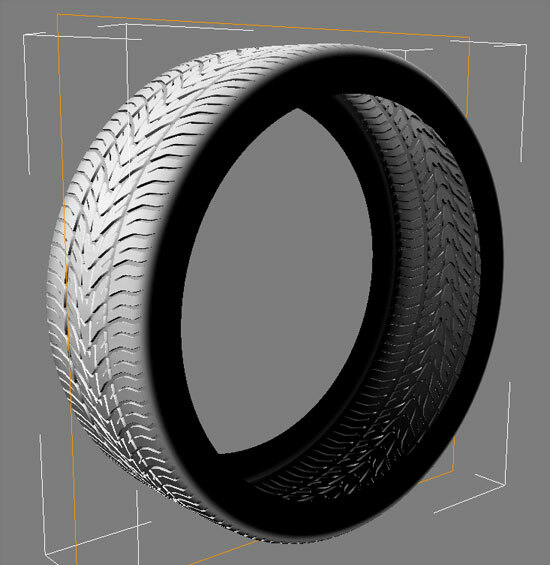 This will be for our Bump map in the Tyre sidewall. This is separate from the Gradient Ramp - so we can scale and adjust the position of the bump map independently from the Gradient Ramp mask.